Michael Phelps used swimming as an outlet for his Attention Deficit Hyperactivity Disorder (ADHD). Water indeed worked miracles on this Olympic champ. But water can do more than just propel fast swimmers to the finish line. Through a method called Aquatic Therapy (AT), water can likewise improve issues in other developmental conditions like autism, Down Syndrome, cerebral palsy, etc. Cristina de Leon-Hinlo, a pioneer in AT who brought the method to the country to help children and adults with special needs, recently discussed the topic to participants at a seminar conducted by Autism Society Philippines (ASP). Aquatic therapy started way back in history, when water began to be used to soothe body illnesses. Eventually, water also became an element to cure the injured, and then used for persons with developmental delays. Hinlo, program director of Therapy Works Inc., says aquatic therapy is effective as early intervention for children with cerebral palsy or Down Syndrome. Aquatic therapy can also help infants improve motor skills, focus, self esteem, trust, intelligence, among others. Moreover, the therapy can be especially beneficial by using a carefully planned aquatic program for children with sensory processing issues. However, Hinlo says that the benefits differ and depend on the condition and needs of the child. “The younger the child is, the more basic the needs are. Like water adaptation muna, or playing in the water. You also don’t expect them to have a long attention span as the bigger kids so you give them activities that are appropriate for their age and condition,” she says. The therapy works better on children with cerebral palsy, down syndrome, and likewise beneficial to adults who suffered from stroke, back pains, and cardiac condition that needs gradual conditioning. Aquatic therapy can help improve a child’s self esteem, physical strength and coordination, regulate eating and sleeping patterns, stimulates socialization. Hinlo recommends at least eight sessions, one session per week, to fully see its effects. IS IT THE RIGHT THERAPY? 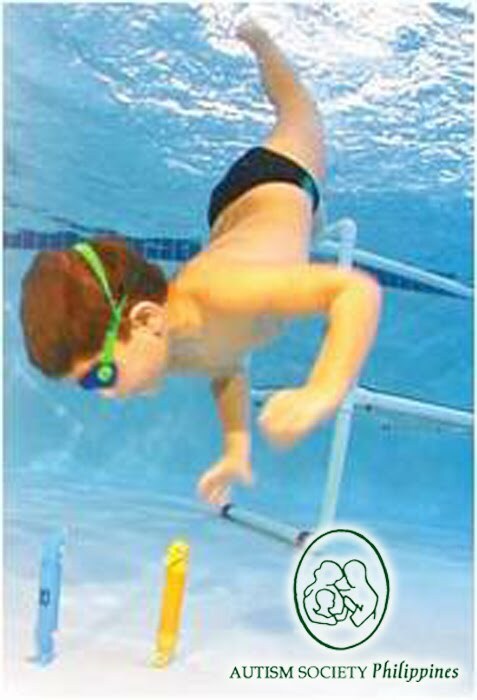 Before entering aquatic therapy, children should first have a good land-based evaluation such as occupational therapy. “Aquatic therapy is a good supplement for land-based therapy but it’s not a stand alone. Whatever their needs are, for land let’s say, they need to improve their sensory skills so water is a very, very good venue for that,” relates Hinlo who finished her BS Occupational Therapy degree at the UP College of Allied Medical Professions. Hinlo also encourages parents to be involved in this kind of therapy because it makes all the difference in a child’s improvement. “Gusto namin kasama ‘yung parents kasi gusto namin ginagawa nila sa bahay nila kasi aquatic therapy is only once or twice a week, they have many other days of the week and the more they have a child in the water, the better. We ask them to join the session and learn the basic and specifics. Sometimes parents do it but not always it may look the same but the demands of the therapists are different with the goal of the parents,” she says.